Free Slurpee Day at 7-Eleven on 7-11-14! 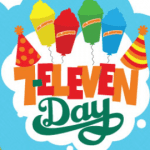 Every year 7-Eleven celebrates 7/11 with a free slurpee! Stop in to your nearest 7-Eleven for a free small slurpee from 11am to 7pm on Friday, July 11, 2014! Also, if you download the 7-eleven app, you can receive free stuff from 7/12 to 7/19/14! For more information about Free Slurpee Day at 7-eleven, please head here.